My family likes to eat rice, rice with chicken orwith veggies, brown rice, white rice – we love it all. So I decided the time had come to invest in a rice cooker. I wanted an easy-to-use large capacity rice cooker that had great reviews, and I found it in the Zojirushi NP-HBC10. The Zojirushi NP-HBC10 can cook 5-1/2 cups of rice to perfection. It is fairly compact – measuring 14-3/16″ x 9-13/16″ x 7-15/16″ which leaves plenty of space on the countertop to prepare the rest of the meal. One of the best features of the Zojirushi NP-HBC10 is its micro-computer technology that works along with induction heating to provide perfect results every time you use it. There are various settings for the different types of rice you may use – brown rice, white rice, sushi rice, mixed rice and more. It features an easy-to-read LCD panel which includes a clock and a timer so you can keep an eye on when to begin preparing the other portions of your feast. You can set it on a delay timer so the rice will be ready when you get home from work and it also has an automatic keep warm feature. It has a detachable/washable inner lid and a detachable power cord, and its sleek design would look great in any kitchen. 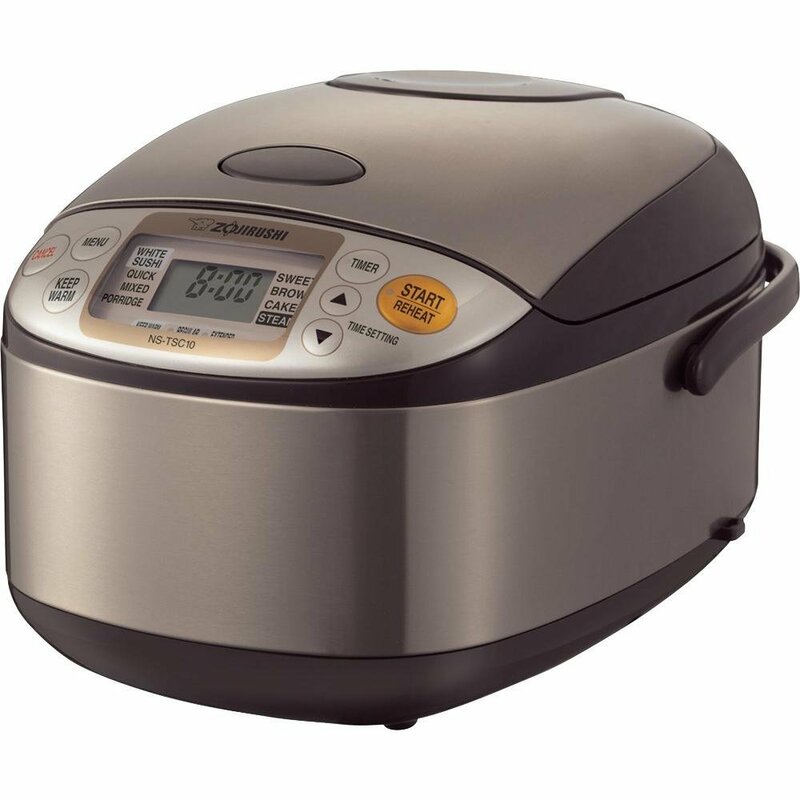 A compact design, reliable results and easy to clean rice cooker – exactly what I was looking for! The 5-1/2 cup uncooked capacity is the perfect size for a large family and the keep warm feature will keep rice nice and warm and fluffy, not burnt or scalded. I believe the Zojirushi NP-HBC10 is just what we need in our rice-loving home.